Add this vanity to your bathroom for more modern style in your home. Made with a special grey solid wood base and a white marble counter, this piece will make your bathroom look even nicer. Its double-door cabinet and drawers have lots of room to keep all of your bathroom items. This set from Wyndham Collection is great for anyone looking for great style and function in their bathroom. Designed with a modern style and strong build, this vanity is a perfect choice for any bathroom. The white marble counter and grey solid wood base make this piece great for any bathroom. Its single-door cabinet and drawer have lots of room to keep all of your bathroom items. Put together your perfect bathroom with this stylish vanity set from Wyndham Collection. With a modern look and strong design, this vanity will help any bathroom look nicer. The white marble counter and grey solid wood base make a beautiful look in your bathroom. Its drawer and roomy single-door cabinet are great to keep bathroom items in. Put together your perfect bathroom with this stylish vanity set from Wyndham Collection. 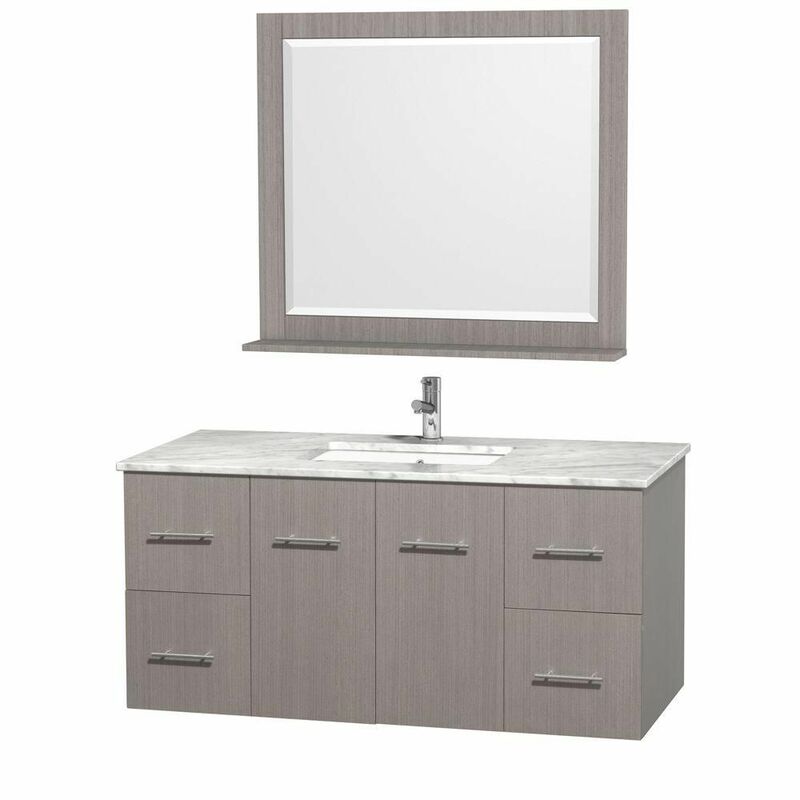 Centra 48-inch W 4-Drawer 2-Door Wall Mounted Vanity in Grey With Marble Top in White With Mirror Add this vanity to your bathroom for more modern style in your home. Made with a special grey solid wood base and a white marble counter, this piece will make your bathroom look even nicer. Its double-door cabinet and drawers have lots of room to keep all of your bathroom items. This set from Wyndham Collection is great for anyone looking for great style and function in their bathroom. Centra 48-inch W 4-Drawer 2-Door Wall Mounted Vanity in Grey With Marble Top in White With Mirror is rated 3.3 out of 5 by 3. Rated 3 out of 5 by Jenny from not happy wity the carrara marble top First, as someone already mentioned they dont even offer an option of purchasing a matching backsplash. Second, the color of the carrara marble is very dissapointing, not at all looks like on the picture. Rated 4 out of 5 by Designerdave from Color It's very nicely made but be prepared it is a purplish grey hue. The mfg really needs to adjust their grey to be Grey not purple.